My initial concept of visual contrast was very limited. I thought that contrast consists of something visually standing out due to being darker or lighter than what’s next to it. I was aware that you could create color contrast. But his lecture really opened my eyes to the endless forms of visual contrast that take part in an artwork and shape the way we experience it. Rather than explaining it all through text, I will use pictures of artworks to point out how the artist used different types of contrast to emphasize and de-emphasize his subject matter and other elements in the work. 1. Let’s start with the basic value contrast. This just means making your subject matter stand out by using elements with a different value behind it. Notice how the right leg shines in contrast to the dark background, how the reflected light in the shadow area of the back shines in contrast to the dark dark shadow on what the figure is leaning on and how in fact there is almost no areas where the value of the skin doesn’t significantly differ from what’s behind it. 2. Color contrast; Color contrast is about using two different colors adjacently. Colors are further removed from one another when they don’t have any color in common in their mixing process. For example, green is a mixture of blue and yellow and therefore it is closer in hue to blue than red is. One common and accepted way to understand color is using the color wheel which shows a division of warm and cool colors and color opposites (or complementaries). Yellow is the opposite of violet, red is the opposite of green and blue is the opposite of orange (as shown on the wheel). Yellow, red and orange are all considered warm colors and blue, green, black (and also white) are considered cool. This division is subjective according to our human way of experiencing the world. But the bottom line is that artists can use complementary or near-complementary colors to emphasize one another. 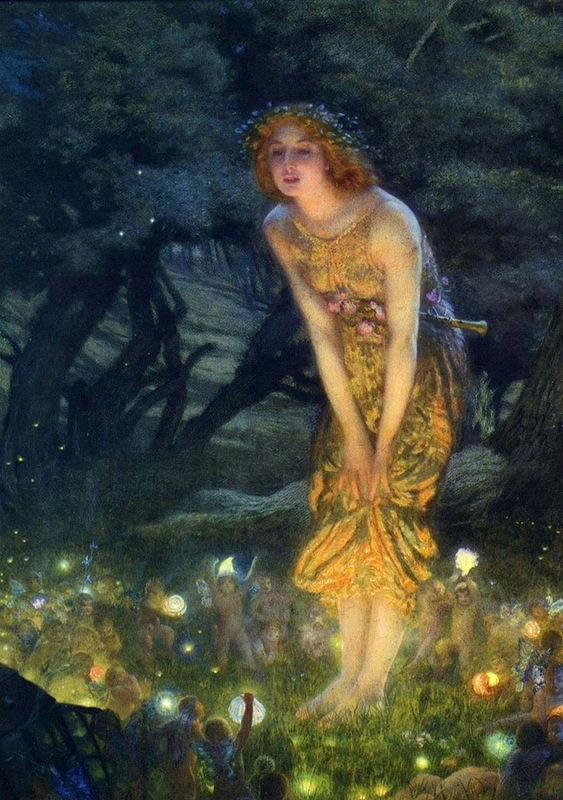 In this painting, the figure and the fairies are all in warm colors and the background is all cool, which makes the yellow and orange seem warmer and more glowing than if they were set against a warm background. 3. Saturation contrast: In this painting, most of the large shapes (the sky and the sand) are kept at low saturation and then the same hue is used on the figure but with the chroma kicked up. There are very few colors in this painting and the same colors are used throughout the painting but with different saturation. This makes the figures appear very vibrant, which would not have happened if the background were just as saturated or more. 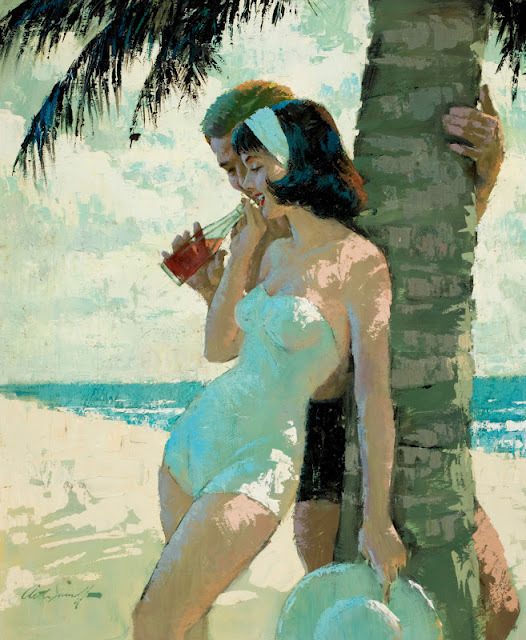 All the saturated elements are used to move the eye across the painting: the sea, going through the woman’s bathing suit, then down to the hat and back up her legs to the heads and the drink. 4. Flatness vs. volumetric elements: The vast majority of the elements in this painting by Frazetta are described as a flat mass of tone. The background hills, the plants surrounding the woman and even the ape. They have a few details and form implied very subtly but for the most part they are flat. In contrast, a few select parts of the bottom branches and the woman are all about form, they describe the anatomy in a way that emphasizes that it is a three dimensional object, with all the subtlety of muscle, gesture and volumes turning in space. Our subconscious mind, always seeking out patterns, picks up on the flat pattern of the background elements and groups them together as one category, which creates contrast to the woman’s detailed volume and the branch moving toward the viewer on which she is standing. Mass vs. Form. 5. Detail-Dense vs. Smooth; Many old sculptures describe the body in a very smooth way, making all the transitions between different forms and planes incredibly subtle and delicate, leaving very few subtle shadows, and then make everything surrounding the figure incredibly detailed with deep crevices and deep shadows, and high density of details. This way the viewer’s eye finds relief in the smooth planes of the figure and the details in the extremity act as an intricate frame to draw the viewer back in. 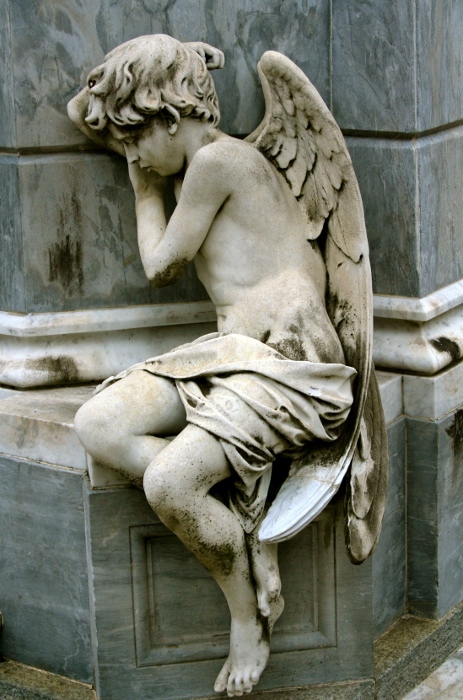 In this sculpture the hair, the wings and the loin fabric all have high density of detail, volume and plane changes and shadows while the figure is smooth, with hardly any form shadows making the boy-angel appear even more angelic and pure. 5. 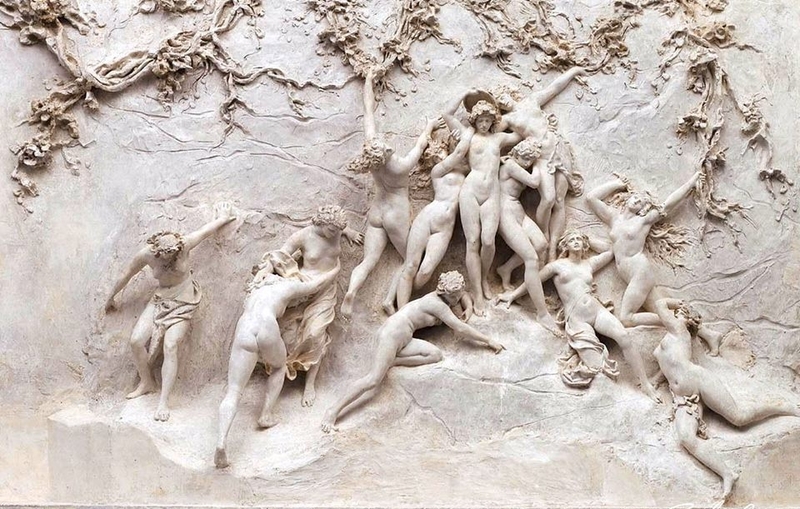 Motion vs. Stillness and contrast of angles: In this sculpture relief, the highest, most dominant figure stands completely straight in a stable manner, in contrast to the other figures which are all in motion and at an angle. This enhances the feeling that our main figure is a stable pillar supporting the mass of everyone else and it makes her ultimately take up most of the attention in this piece, despite being the one figure who is engaged in the least amount of action. If these figures were displayed individually, it is very likely that one of the figures in extreme motion and gesture would receive more attention than the one standing straight. But in the context of the image our mind looks for the exception, and she is it. If a painting displays mostly round objects, then the one object that is a square is going to receive a lot of glances. If everything in a painting is painted roughly, but one area is highly refined it will stand out. So in conclusion deliberate use of visual patterns can be used in a work of art to emphasize and de-emphasize different elements and enhance the story-telling of a piece. This was a really stimulating read. The examples are particularly vivid. I’ve long enjoyed the Frazetta painting (same with the other masters in that genre), but I think I understand better what I find so great about it. Thanks so much West! Thanks for the feedback. Loved your article! Sometimes I think I know more than I actually do! Thanks so much Christine, I’m glad you like my articles here. SUPERB, SIMPLE, AND YET SO COMPREHENSIVE AND WITH DEPTH. I like the way you taught it. I especially liked the flat, volumetric contrast. It can give such an arresting feeling, even scary. Never thought that you could make something glow more, with color contrast. And also that beach scene, is so expressive with just contrast. All 5 concepts would be in my mind, as I see more. Very good article for non artists too. thanks. Thank you very much, Narendra. I’m glad it was clear. I should mention again that I’ve learned it all from that online class by Bill Perkins.